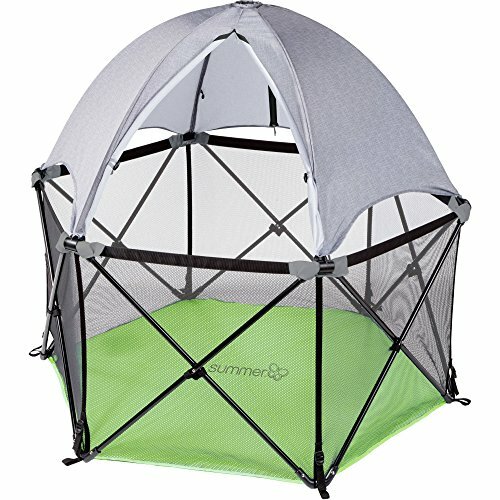 The Summer Infant Pop n Play Shaded Portable Playard allows you to easily create a safe portable play area for your child. The ultra-lightweight and compact fold playard can be set up and taken down in seconds, making it perfect for use at home, a day at the park, or a weekend at the beach. The water resistant floor helps keep baby dry even on damp grass. Airy mesh sides provide added visibility. A travel bag with shoulder strap is included for on-the-go convenience. Size: The 14 square foot freestanding, portable playard can be used inside or outdoors and measures 48 inches wide by 26 inches tall. Helps protect baby from the sun's harmful UVA and UVB rays. Freestanding and portable for use inside or outdoors. 14 square feet, 48" wide and stands tall at 26"